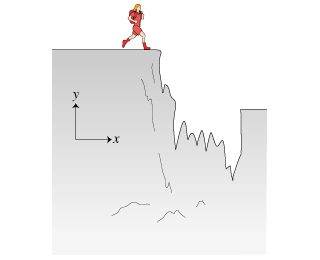 A) Determine the algebraic sign of Alex’s x velocity and y velocity at the instant he leaves the ground at the edge of the crevasse. B) Determine the algebraic signs of Alex’s x velocity and y velocity the instant before he safely lands on the other side of the crevasse. At the buzzer, a basketball player shoots a desperation shot. The ball goes in! 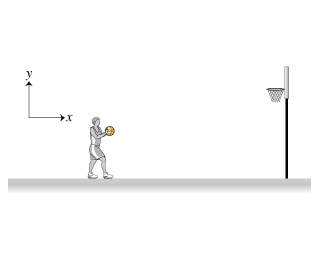 C) Determine the algebraic signs of the ball’s x velocity and y velocity the instant after it leaves the player’s hands. D) Determine the algebraic signs of the ball’s x velocity and y velocity at the ball’s maximum height. The algebraic sign of the velocity is determined solely by comparing the direction in which the object is moving with the direction that is defined to be positive. In this example, to the right is defined to be the positive x-direction and upward the positive y-direction. Therefore, an object moving to the right, whether speeding up, slowing down, or even simultaneously moving upward or downward, has a positive x velocity. Similarly, if the object is moving downward, regardless of any other aspect of its motion, its y velocity is negative.